The basic rule for any treatment of the oil inventory is to remove only the undesired substances from the oil. 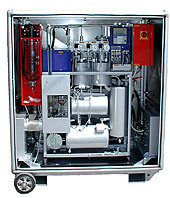 The "soft" removal of the diluted water from the oil is easily achieved (without a high vacuum and high temperature, which potentially deteriorate the oil), by freezing up the water vapour under low vacuum and by reaching oil temperature rates at only about 60C, because the water removal process is simultaneously intensified by a so-called bubble bed procedure. A continuous degassing of the oil without the undesired removal of light oil fractions enables the liquid piston principle simultaneously. 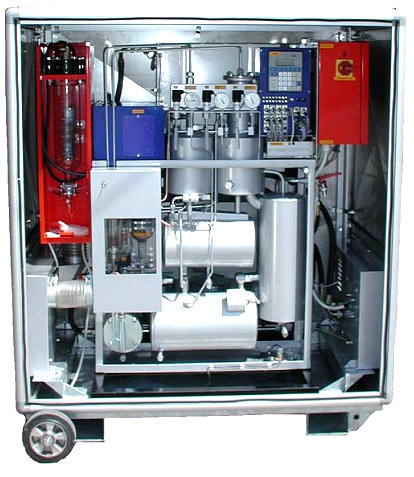 In the first stage (evacuation), the sinking oil level acts as a piston and creates the vacuum necessary to separate gases and vapours from the oil. In the second stage (compression), the liberated gas mixture is gradually compressed by the rising oil level. The condensation of oil vapours takes place and the light fractions get mixed back in the oil. Only non-condensable substances are then expelled from the drier into surroundings. Ask us anything about VS-06 via our online feedback form.